‘The F Word’ is Lily Pebbles thoughts on female relationships. If there’s one piece of invaluable advice for women and girls of all ages, it is that there is nothing more important than creating and maintaining strong, positive and happy friendships with other women. In a culture that largely pits women against each other, I want to celebrate female friendships… all strings attached! If my 1998 diary is anything to go by, female friendships are incredibly complex and emotional but they’re the mini love stories that make us who we are. For many women, friends are our partners in crime through life; they are the ones who move us into new homes, out of bad relationships, through births and illnesses. In The F Word I’ve set out to explore and celebrate the essence of female friendship at different life stages and in its many wild and wonderful forms. When it comes to female friendships, they are occasionally a bit of a minefield, they’re no longer as straightforward as when we were children, when we approached someone in the playground and asked if they wanted to be your friend. Granted, now as an adult you could try that approach but it might result in some odd looks before backing away. As, we get older friendships become harder, we outgrow friends, as we might be travelling at different paces, we might have a difference of opinion or there just might be that one friend that doesn’t bring out the best in you. 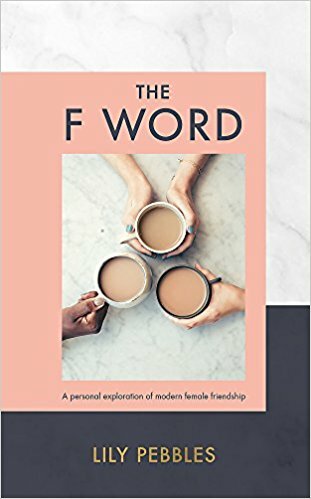 ‘The F Word’ is a great insight into the workings of the female mind and particularly the relationships between women. It might not provide any earth shattering information, but it provides informative and useful advice into dealing with different personalities at different times. The book is written in a laid-back style that made for entertaining reading that I found myself relating to on many levels. My friendships vary, there’s work friends, social outgoings, school friends and there’s that one friend who’s always there, no matter what they are going through. That person, who means the world to you. Lily writes frankly and honestly about her friendships through the years, how they’ve developed or faded away and she speaks frankly of moments of jealousy, that no-one ever wants to admit to. There’s tips on how to handle all types of relationship dramas and there’s an useful inclusion of how to make new friends on social media and the do’s and don’t’s of interactions. Although the cover of the book and the content of the book suggests it’s for an older market, I did think this book was more suited for the Young Adult audience, for those heading off to university and unsure how to make new friendships. Either way, ‘The F Word’ is a fun and fresh book with some warm humour and honesty dotted throughout. You can buy The F Word: A personal exploration of modern female friendship from Amazon and is available to buy from good bookshops.